A bedroom at Wing’s Neck Lighthouse on Cape Cod. If a seaside getaway is what you’re looking for this summer, there’s a lot to be said for staying in a remote lighthouse. A lighthouse is romantic and exotic, and when you check in, you’re pretty much guaranteed unimpeded sea views. Crowds and noise and neighbors are usually not an issue. 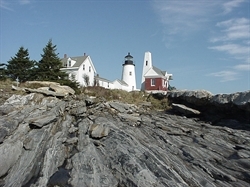 There are a handful of lighthouses around the US and Canada that offer guest accommodations in their former keeper’s quarters and out buildings. Some are more spartan than others — this is about the experience of sleeping in a lighthouse, not a luxury getaway –but all of them fit the bill for a unique getaway. And hey, it may finally give you a chance to read something that doesn’t require an electronic device for transmission. 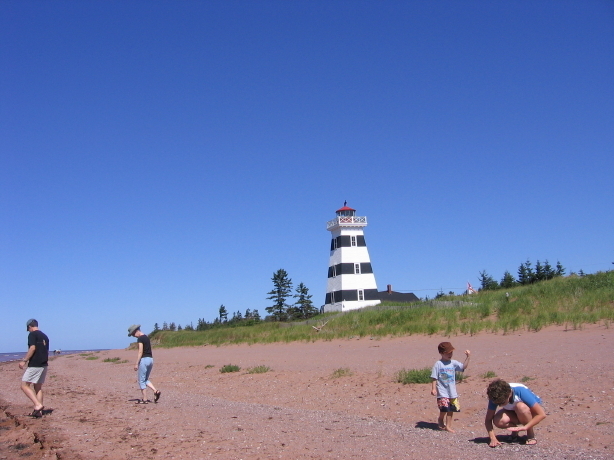 The West Point Lighthouse Inn on Prince Edward Island has 13 rooms with view of the Northumberland Strait. Eleven of the rooms have decks and two of them — The Keeper’s Quarters and the Tower Room — are located within the historic lighthouse museum. Rates for the one bedroom Tower Room are $160 CAN per night. Rates for the Keepers Quarters, with two queen sized beds, are also $160 CAN per night. Both have private bath. Race Point Light, Provincetown, with the Keeper’s House on the left and the Whistle House on the right. Miles of unspoiled beaches and the chance to see plenty of whales and seals and shorebirds is a good reason to consider booking Race Point Light, located among the dunes at the tip of Provincetown, at the very end of Cape Cod. You can stay in the three-bedroom Keepers House, with rates from $145 per night, per room, or in the two bedroom Whistle House, which rents weekly from $2,000. Wings Neck Lighthouse, Cape Cod. 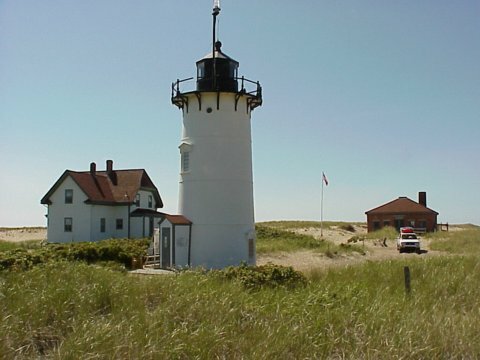 The Wings Neck Lighthouse was built in 1849 in the town of Pocasset on Cape Cod. This former US Coast Guard Lighthouse is no longer active, but you can rent the three-bedroom keepers home by the week and enjoy endless views of the Atlantic Ocean. Weekly rates from $2,500. 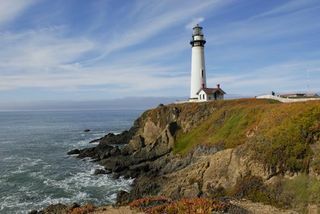 On the West Coast, you can spend just $23 per person for a dorm room at the Pigeon Point Lighthouse Hostel , some 50 miles south of San Francisco in Pescadero. The now automated 115-foot Pigeon Point Lighthouse has been guiding mariners since 1872. The best part may be a hot tub with a panoramic view of the Pacific Ocean. There are also double rooms from $65. 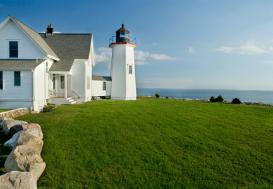 On the coast of Maine, the Keeper’s House is attached to Pemaquid Point Lighthouse. The tower was constructed in 1835 and the light was automated a century later, in 1934. You can rent the second floor apartment in the Keeper’s House, which has a single bedroom. The rocking chairs on the front porch give you a comfortable perch to enjoy some of the best scenery on the entire Maine coast. Weekly rentals from $1,150. 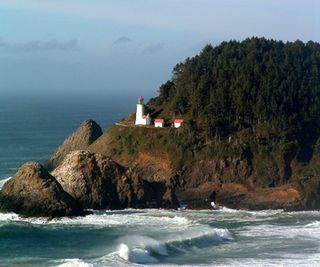 Steve Jermanok just wrote in these pages about one of the country’s most dramatically situated lighthouse accommodations, Heceta Head Lighthouse and Light Keeper’s house in Oregon. But it’s worth another mention. Built in 1894 and now on the National Register of Historic Places. This working lighthouse is set on a cliff with a magnificent view of the Pacific Ocean. It also functions as a bed & breakfast, with six rooms starting at $133. The only thing that rivals the view is the legendary seven-course breakfast that’s served daily. you can also sleep in the light keeper’s house on Quirpon Island off Newfoundland and Labarador. And you’ll be the only residents of the island.